Alexander II became Tsar. He took the traditional title of Emperor and Autocrat of all Russia. Russia was defeated in the Crimean War. A state bank was established. Serfdom was abolished when Alexander signed the Emancipation of the Serfs bringing serfdom in Russia to an end. A group of students published ‘Young Russia’ which argued that reform was essential and that revolution was the medium necessary to effect change. This conflict began when a number of Poles refused to be conscripted into the Soviet army. Many Poles were also dissatisfied because they had not been granted Emancipation. Universities were allowed to become self-governing bodies. The novel ‘What Is to Be Done?’ written by Nikolai Chernyshevsky, a revolutionary who was imprisoned, was smuggled out. The novel was to be a big influence on Vladimir Lenin. The Zemstva, a form of local government, was established. It had responsibility for providing local services including health and education. The judicial system was reformed with local courts dealing with minor offences and district courts dealing with more serious crimes. Censorship reforms were introduced with new more relaxed guidelines being introduced. Alexander II’s son and heir, Nicholas, died from meningitis. His second son, Alexander became heir. Many nobles, ministers and Alexander’s son and heir, the future Alexander III, felt that the reforms had gone too far, destroying the old order and allowing an influx of Western ideas. They persuaded Alexander to replace liberal ministers with more conservative ones. Alexander’s son and heir, Alexander, married Princess Dagmar of Denmark. She had converted to Russian Orthodoxy and taken the name Maria Feodorovna. She was an imposing, charismatic woman who was highly influential on her husband and children. The book ‘Catechism of a Revolutionary’ by Mikhail Bakunin and Sergei Nechaev was published. It argued for opponents of autocracy to keep up the struggle and press for revolution. ‘The Communist Manifesto’ by Karl Marx was translated into Russian. Elected town councils called dumas were introduced to urban areas. Railway mania years saw substantial government investment in Railway construction. Dimitri Tolstoy, minister for education, insisted on a return to a classical curriculum. Universities were forbidden from including any subjects that encouraged critical thinking. As part of a major reform of the armed services, military service was extended to all classes, inhumane punishments were abolished, military colleges were set up and modern weapons were introduced. The populist ‘Go to the People’ campaign spread by nihilists and narodniks. Their aim was to persuade peasants to rise up against the regime by stirring up resentment at their lack of land and the taxes they had to pay. More than 1,500 exponents of the Populist Movement had been arrested. Another Populist ‘Go to the People’ campaign failed. Populists were put on trial as populist revolutionaries who spread propaganda against the Russian government. A number of Populists that had evaded capture set up ‘Land and Liberty’ but it soon became clear that the peasants were not interested in joining a full scale revolution. Russo-Turkish War began. Russia declared war on Turkey in support of the Balkan States who were fighting against Turkish rule. General Mezemtsev, head of the Third Section and Prince Kropotkin were assassinated by members of the ‘Land and Liberty’ group. The assassins escaped amid a wave of popular support. The war with Turkey ended with the signing of the Treaty of San Stefano. The Russians had secured autonomy for the Balkan States and created Bulgaria under Russian protection. However, Britain and Austro-Hungary protested against this and Bulgaria was split under the Treaty of Berlin. The People’s Will declared that the Tsar had to be removed. A poor harvest in 1879 led to famine in 1880. Alexander II married his mistress Caterina Dolgoruki just 40 days after the death of his wife. A spate of arrests severely weakened the Black Partition group. Alexander II was assassinated by the ‘People’s Will’ group. He was succeeded by his son, Alexander III who was much more conservative than his father. Almost immediately he ordered the rounding up and arrest of the assassins and put a ban on secret meetings. Von Plehve was appointed to investigate the assassination of Alexander II. He was made Director of the Police which gave him full control of the entire police force and Okhrana. Alexander III pursued a policy of Russification enforcing the use of the Russian language throughout the provinces and persecuting non-Russians especially the Jews. A number of anti-Jewish pogroms took place. The Okhrana (security police) were given new powers to search, question, detain and even exile anyone who was likely to commit a crime. First Russian Marxist group formed in Geneva by former members of the Black Partition group. The novelist Leo Tolstoy, famous for his ‘War and Peace’ and ‘Anna Karenina’ novels was fiercely critical of the Tsarist regime but wanted a bloodless revolution brought about by a moralistic reformed society. He wrote a tract entitled ‘What I believe’ which was banned a year later but was hugely influential nevertheless. A law was passed banning women and children from working at night. ‘Closed’ court sessions without juries were re-introduced for a number of crimes. Ivan Vyshnegradsky became Minister of Finance. He wanted to improve Russian finances and build up the gold reserve. Ivan Vyshnegradsky negotiated a loan from France which was used to grow the economy. Alexander III set up the new office of Land Captains. Recruited from the nobility these Land Captains had the power to over-ride decisions made by local Zemstva, overturn local court decisions and impose their own punishments. An act was passed that reduced the peasant’s vote in elections. Ivan Vyshnegradsky introduced a Tariff Act which reduced imports of foreign raw materials. Over the last years he had increased exports of grain by 18%. Work began on the Trans Siberian Railway. Around 2 million peasants died of starvation. Despite the famine, Russia continued to export grain, a move which was seen as controversial and led to the dismissal of Vyshnegradsky. Famine victims received no relief from the Tsar or government and it was left to middle class philanthropists to provide aid for those feeling the worst effects of the famine. These middle classes became more opposed to the Tsar and wanted a voice in government. Sergei Witte became Minister of Finance – he also believed in economic modernisation and believed that Russian growth was hampered by – insufficient capital, Lack of technical expertise, insufficient manpower in industry. An act was passed that made it difficult for poor people living in towns to qualify for a vote. Alexander III died of kidney failure. He was succeeded by his eldest son Nicholas II who, like his father was a committed autocrat. However, unlike his father, Nicholas had no interest in politics and would have preferred not to be Tsar. Nicholas married Alix of Hesse, grand daughter of Queen Victoria. She had converted to Russian Orthodoxy and taken the name Alexandra Feodorovna. Vladimir Ilyich Ulyanov (Lenin) was arrested for distributing revolutionary material to workers. He was imprisoned to await trial. Russia had increased industrial output significantly and had become the World’s fourth largest industrial economy. However, the rise in industrialisation had led to a move away from the countryside to the cities where people depended on sufficient incomes to pay for rent, food etc. Those that rose through the ranks of industry to become managers together with those professionals that served the cities – doctors, teachers, bankers etc created a new middle class that wanted political representation. The General Union of Jewish Workers, known as The Bund, was formed. It was strongly opposed to the autocracy and sought to advance Marxism. Vladimir Ilyich Ulyanov (Lenin) was exiled to Siberia for three years. He had not been given a trial. Sergei Witte introduced a new rouble backed by the gold standard. This meant that the value of the new rouble would remain fairly constant and led to an influx of foreign investment. Russian Social Democratic Worker’s Party formed based on the theories of Karl Marx and Frederich Engels. The average Russian working day was 11 hours for weekdays and 10 hours on a Saturday. Their living conditions were poor with many living in hastily erected buildings. Overcrowding was rife and facilities very poor. More than 40% of city houses had no running water. The government ordered that hundreds of liberals be dismissed from the local Zemstva. Lenin was released from exile and settled in Pskov. He began raising funds for a pro Russian Social Democratic Labour Party (RSDLP) newspaper ‘Spark’. Lenin travelled to Switzerland to meet other Marxists. It was agreed that ‘Spark’ would be produced in Munich. Lenin moved to Munich to produce the paper. A worldwide depression caused an economic slump which in turn led to social and industrial unrest. The Socialist Revolutionary Party was formed by Viktor Chernov. They believed that Russia should reform through armed revolution, that there should be no private land ownership, democratic elections should be held and an 8 hour working day introduced. Another poor harvest led to an increase in rural violence. The Commission on Agriculture was established led by Pyotr Stolypin. A landowner himself Stolypin took a hard line on unrest. Lenin wrote and published a pamphlet entitled ‘What is to be done.’ In the pamphlet he argued that trade unionism would not bring about reform alone that only an overthrow of the established Tsarist regime would bring a new reformed Russia. Most of the Trans Siberian Railway had been completed. This meeting of the Russian Social Democratic Labour Party was held in London over a period of two weeks. The Social Democrats split into Bolsheviks led by Lenin and Mensheviks led by Martov. Lenin and the Bolsheviks wanted a full revolution while the Mensheviks were prepared to work with liberal groups to bring about reform. Bolsheviks wanted to restrict membership to the party and lead from a central core while the Mensheviks wanted an open membership and a democratic run party. Pyotr Struve formed the Union of Liberation in exile in Germany. Struve was opposed to the Marxist idea of violent revolution and rejected both the Bolshevik and Menshevik models hoping that Russia would evolve naturally into a constitutional monarchy through which reform would follow. Sergei Witte became president of the Council of Ministers. Although this was a promotion, in real terms the position offered much less power than he had had as Finance Minister. The ‘holy man’, Rasputin arrived in St Petersburg. War broke out when Japanese forces attacked and lay siege to Port Arthur on the Liadong Peninsular which had been leased to Russia by the Chinese. The Japanese had designs on the regions of Manchuria and Korea as areas to expand their own territory. Prices of essential goods had risen so much that workers were effectively 20% worse off than they had been a year ago. Von Plehve, Interior Minister assassinated by the Combat wing of the Socialist Revoutionary Party. Nicholas II ordered the Baltic Fleet to sail to the East. Sailing out from the Baltic the fleet opened fire on two of its own ships believing them to be Japanese. In the firing a British fishing vessel was sunk killing two fishermen. This provoked an outcry in Britain and war with Britain was only avoided by the payment of a huge fine. Port Arthur fell to the Japanese. Rasputin was introduced to the Royal family. He seemed to have the power to reduce the pain of the royal couples son, Alexis who suffered from haemophilia. Father Gapon called for his Union members to strike in protest at the dismissal of four iron workers for being members of the union. The entire workforce of the Putilov Ironworks in St. Petersburg went on strike when the management refused to reinstate the four dismissed members. 150,000 workers in 382 factories were now on strike in support of the four dismissed ironworks workers. St Petersburg was without power. Father Georgy Gapon had organised a peaceful march to present a petition to the Tsar to ask for measures to be put in place to treat the Russian people more fairly. The marchers included men, women and children carrying banners of the Tsar singing religious hymns. However, when the marchers reached the Winter Palace they were met by a line of armed Cossacks who opened fire on the demonstrators. More than 200 demonstrators were killed and more than 500 injured. Father Gapon escaped and left Russia. The event, known as Bloody Sunday sparked a series of revolts known as the 1905 Revolution. Grand Duke Sergei Alexandrovich, Nicholas II’s uncle, was assassinated by the Combat wing of the Socialist Revolutionary Party. The Japanese won the battle of Mukden. More than 90,000 Russian soldiers had lost their lives. The All Russian Union of Railway Workers was established. Russian Baltic fleet reached the east and were defeated by Japanese at The Battle of Tsushima. The Potemkin battleship sailors mutinied after refusing to obey the Captain’s order to execute sailors protesting against being served rotten meat. The Captain and officers were thrown overboard. The sailors then sailed to Odessa where they proceeded to foment revolution through drunken speeches. The police and Cossacks used violence to break the revolution killing 2,000 people and injuring 3,000. The sailors escaped by sailing to Romania. Russia was defeated in the Russo-Japanese War. Sergei Witte was sent to negotiate the Treaty of Portsmouth which agreed that both Russia and Japan would leave Manchuria and return it to Chinese rule. Russia lost Port Arthur to the Japanese. There were strikes by workers across Russia and a strike by the railway workers paralysed the rail network. General strikes in Moscow brought the city to a standstill. Trotsky who was a member of the Mensheviks returned to Russia and became a member of the St Petersburg Soviet. Other Soviets were formed by Mensheviks and Bolsheviks. This was issued and agreed by Nicholas II to try to appease the people. It promised: Freedom of speech, Freedom to hold meetings, No laws to be introduced without the agreement of the Duma. Political parties were no longer banned, elections to the Duma were agreed. Many strikes broken up by violence and strikers fearful of the violence returned to work. Pyotr Struve returned to Russia and together with Pavel Milyukov founded The Constitutional Democratic Party (Kadets). They believed that the October Manifesto was the first step towards a true democracy. They wanted The Royal family to become a constitutional monarchy rather than have the Tsar as an autocratic ruler. The term Nationalists was coined to describe those nobles and politicians who ideally wanted things to remain as they had for centuries but understood that Nicholas had no choice but to issue the October Manifesto. They were against an elected Duma but saw it as a necessary concession. Within the Duma, Nationalists voted in favour of laws that were favourable to the Tsar and nobility but against reforms that improved the lives of the people. The Union of October 17 (Octobrists) was formed. It was a centre party that believed the October Manifesto was the solution to political demands and backed the Tsar. There was a second General Strike in St Petersburg calling for an 8 hour working day. Lenin returned to St Petersburg. Peasant Union leaders were arrested. Leon Trotsky became head of the St Petersburg Soviet after its leader was arrested. Soldiers returning from the Russo-Japanese war were used to put down all traces of unrest and revolution. Trotsky and all members of the St Petersburg Soviet were arrested. Nicholas once more assumed an autocratic rule with little regard for the October Manifesto. Father Gapon returned to Russia. Sergei Witte persuaded Nicholas II to allow the introduction of an elected Duma. Father Gapon was found hanged. He was possibly murdered by the Okhrana. This law declared Nicholas a supreme autocrat. The Duma could not make laws without his approval and Nicholas was to have the final say in the appointment of ministers and other officials. Nicholas forced Prime Minister Sergei Witte to resign and replaced him with Ivan Goremykin. The first elected Duma began. The Bolsheviks and Social Revolutionaries had refused to field candidates and the largest political group in the first Duma were the Kadets. Nicholas firmly rejected all proposals put forward by this Duma as too radical. The Duma was dismissed and Goremykin was replaced by Stolypin. Stolypin introduced military courts to deal with political unrest. Those accused were denied representation and those found guilty were executed within 24 hours. The amount of land available for peasants to purchase was increased. Peasants were given the right to leave the commune (Mir). Leon Trotsky escaped from prison and travelled to Western Europe. Stolypin had tried to influence the elections by supporting the more moderate Octobrists but he failed and a more radical government made up of Bolsheviks, Mensheviks and Kadets was elected. Stolypin was continually frustrated by this Duma who would not support his agrarian reform policy. Stolypin dismissed the Second Duma. He then used an emergency law to alter the franchise giving increased priority to the landed gentry. This was known as the Duma of Lords and Lackeys due to the dominance of the noble classes who were more conservative. This government agreed to Stolypin’s agrarian reforms, especially the removal of the Mir allowing peasants to own their own land. Redemption payment was abolished due to so many peasants being in arrears. 30,000 people in St Petersburg died of cholera caused by the insanitary living conditions. Leon Trotsky published the Communist newspaper, Pravda. All communes that had not redistributed land since the 1860s were abolished. The Octobrists who had generally supported the government were now critical of of the Tsarist system. Stolypin was shot twice by Dmitrii Bogrov. He died four days later. Bogrov was arrested and hanged. Most parties had some representation but the new Prime Minister Kokovtsov generally ignored the Duma and pushed through his own measures independently. A workers’ health insurance system was introduced. A group of miners from the Lena Goldfields in Siberia were went on strike after the management took no action on a complaint about the quality of horsemeat the miners were given to eat. The Bolsheviks co-ordinated a wave of support strike action and many thousand workers marched to present a petition in support of the miner’s claims. However, the authorities ordered troops to fire on the protesters causing 500 to lose their lives. The massacre caused an outrage and a wave of sympathy strikes. Nicholas and Alexandra celebrated the three-hundredth anniversary of the Romanov dynasty. The Octobrists, the largest party in the Duma, ordered an investigation into Rasputin. Heir to the Austro-Hungarian Empire, Franz Ferdinand, was assassinated by a member of the Black Hand a Serbian Nationalist group. Ignoring all advice not to involve Russia in the war, Nicholas decided to support Serbia and declared war on Austria-Hungary. The Russian army was badly equipped for war. Most were conscripted peasants who were inadequately clothed and three soldiers had to share two guns. Saint Petersburg was renamed Petrograd (Peter’s City). The move was made to remove the German word ‘burg’ from the city. The All Russian Union of Zemstva and Cities (Zemgor) was established. Chaired by Prince Lvov its aim was to help the government in the war efffort but it was largely ignored by Nicholas. Some members of this Duma organised themselves into a Progressive Bloc and called for the Tsar to change his government ministers for those with the confidence of the public. Tsar Nicholas took personal charge of the army and dismissed the Duma. Although a brave move by Nicholas he did not have sufficient military experience to turn the war to Russia’s favour and moreover made him appear wholly responsible for the continuing defeats Russia faced. Rasputin was blamed for a series of ministerial changes. People were becoming increasingly suspicious of the extent of Rasputin’s influence on the Tsarina. Although the Russian army was now much better equipped than it had been in the early days of the war most of the army’s experienced generals had been killed and without adequate leadership the newly launched Brusilov offensive failed. Large numbers of Russian soldiers deserted. 150,000 workers took to the streets of Petrograd on the anniversary of Bloody Sunday to protest at the desperate situation many were in – lack of food, poor living conditions and Russia’s continued participation in a war that was going from bad to worse. Strikes and unrest continued in Petrograd amid calls for the Tsar to be overthrown. Rumours that bread would be rationed from March led to long queues at the bakers’ shops. 20,000 workers from the Putilov Ironworks went on strike. The annual International Women’s Day march from the suburbs to the centre of Petrograd turned increasingly political as they were joined by students, Putilov strikers and other disgruntled factory workers swelling the numbers of protesters to nearly a quarter of a million people. People continued to demonstrate on the streets. Statues of the Tsar were toppled, people waved the red flags of the revolutionaries and called for an end to the Tsarist system. Many also sang the anthem of the French Revolution, the ‘Marseillaise’, sympathising with its call for Liberty, Equality and Fraternity. Nicholas ordered the Duma to disband but it refused to do so. Nicholas ordered troops onto the streets to remove the protesters by force. Although some complied killing around 40 protesters. Nicholas’s move worsened the matter by inflaming the mood of the protesters even more. Moreover, around 65,000 of the soldiers ordered onto the streets were new recruits who sympathised with the masses and they simply refused to fire on the demonstrators and joined them instead. A meeting of the Duma discussed the future of Russia. They established a Provisional Committee of The Duma and demanded that the Tsar abdicate immediately. At the same time the army generals ordered the soldiers off the streets telling them to support the Provisional Committee instead. The Petrograd Soviet was formed, comprised mainly of Mensheviks it called for representatives of the workers to attend a meeting on 28th February. A meeting took place and a Provisional Executive Committee was elected. The Kronstadt sailors mutinied and put pressure on the Petrograd Soviet to allow army regiments to elect committees which in turn would be able to send representatives to the Petrograd Soviet. The Chief of Staff, Mikhail Alexeev, put pressure on Nicholas II to resign both as head of the army and also as Tsar. Nicholas II reluctantly abdicated as Tsar. He named his younger brother Mikhail as the new Tsar, a position which he refused. The Royal family were placed under virtual house arrest. First Provisional government was formed, led by Prince Lvov, a member of the Kadet party. The new Provisional Government had set about removing all traces of the Tsarist system amid a mood of optimism. Reforms were put in place, Tsarist sympathisers were removed and soviets were established to represent the workers and peasants. However, Prince Lvov was aware that he led a Provisional Government and that many more drastic reforms should wait to be implemented by a fully elected government. Yet this very delay in implementing reforms undermined support for the Provisional Government. Land Committees were set up to collect information regarding land ownership that would be used to implement reforms. However, the peasants did not want to wait they wanted reform now. Many simply seized property that they believed they had a right to. Police, army and bureaucracy should be abolished. Lenin attempted to effect a new revolution and the overthrow of the Provisional Government but only a small number of people turned out onto the streets in support. The Provisional Government’s failure to take Russia out of the War was an unpopular move. More importantly it led to unrest in the army and and the number of deserters increased to more than 365,000. Army generals called for more power to restore order in the ranks but the Provisional Government fearful of an army coup refused. The Provisional Government needed to maintain economic output but although committees were established to represent the demands of the workers, the government still allowed factory owners to decided working hours and conditions. This frustrated the workers who had hoped for improvements in their conditions and in June 175,000 workers went on strike. The Bolsheviks tried to effect revolution by trying to use the June Offensive on the Eastern Front to turn people against the Provisional Government. However, the Bolsheviks failed to gain the support of the Petrograd Soviet and it failed. Leon Trotsky joined the Bolsheviks, convinced that only they had the leadership to overthrow the Provisional Government. There were demonstrations against the government in Petrograd.a Workers were joined on the streets by soldiers and the Kronstadt sailors calling for power to be given to the Soviets. Prince Lvov resigned, unable to control the liberals and socialists within the Provisional government. Kornilov was appointed Commander of the Russian troops. The Socialist Alexander Kerensky became Prime Minister. General Kornilov called for tough measures to restore discipline in the army and to increase economic output. However, although these measures would have helped to restore order they went against the spirit of the Provisional Government. With much of Petrograd at a standstill following the July Days, Kornilov called for martial law to be established in the city. Kerensky refused and fearing an attempted takeover by Kornilov called on the Kronstadt sailors to come to his defence. He also agreed to arm the Bolshevik ‘Red Guards’ so that they could defend the city. Kornilov’s troops travelled by train to Petrograd but railway workers stopped the trains and persuaded the soldiers to desert. 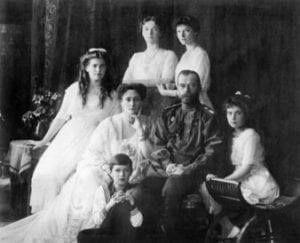 The Romanov family were moved to Tobolsk in Western Siberia. Kerensky was persuaded to release those Bolsheviks that had been imprisoned following the July Days. Leon Trotsky became leader of the Petrograd Soviet. He worked closely with Lenin to plan a Bolshevik takeover. Armed workers, Bolshevik Red Guards and the Kronstadt sailors occupied key buildings around the city of Petrograd. Alexander Kerensky left Petrograd in disguise bound for the front line. The remaining members of the Provisional Government met in the Winter Palace and were still there when armed Bolshevik supporters entered the Palace. They were arrested. A congress of Soviets was held which appointed the first Soviet government and appointed Lenin as Chairman of the Council of People’s Commissars. Joseph Stalin was made Commissar for Nationalities and Leon Trotsky was made People’s Commissar for Foreign Affairs. The Provisional Government’s Cossacks and officer cadets advanced on Petrograd. The Provisional Government’s force were defeated by a large force of Red Guards at Pulkovo Heights on the outskirts of Petrograd. The election that had been promised by the Provisional Government after the February revolution took place. The Socialist Revolutionaries received the most votes but they were not a fully united party. They were split between the left Socialist Revolutionaries who supported Lenin and joined him in forming a coalition government and the moderate Socialist Revolutionaries led by Viktor Chernov. Lenin needed to formulate a plan to prevent the moderate Socialist Revolutionaries challenging the Bolshevik rule. Alexander Kerensky rallied those loyal to the Provisional Government and there was fighting between the two factions especially around Moscow. However, Lenin agreed to talk to other party members and Kerensky lost much support. He eventually fled firstly to France and then to the USA. Lenin created the Supreme Council of National Economy (Vesenkha). His aim was to bring the economy under central government control. Cheka (Communist secret police) established. Its main purpose was to arrest, imprison and execute opponents to Lenin. Lenin used the Red Army to take control of all the banks. A Bolshevik peace delegation led by Alfred Joffe began negotiating a peace with Germany to take Russia out of World War One. The newly elected constituent assembly met in the Tauride Palace, Petrograd. The Bolsheviks proposed that the assembly should be subservient to decrees passed by the Soviet. This proposal was rejected. In response to the rejection of the proposal the Bolsheviks and left Socialist Revolutionaries walked out of the assembly. Red Guards and armed troops loyal to Lenin forcibly dispersed the remainder of the assembly. Lenin changed the name of the Bolshevik party to the Russian Communist Party. The harsh demands placed on Russia by Germany were not well received. Germany wanted to take the Baltic states as well as Poland and Ukraine from Russia, a move that would result in the loss of one third of Russia’s population and agricultural land as well as half of its industry. Lenin faced opposition in his government over the continuation of the peace negotiations but eventually won the opposition over. Lenin declared all debts owed to foreign powers by the Romanovs and the Provisional Government would not be repaid. Trotsky signed a peace treaty with Ukraine. Trotsky formed the Red Army. It was comprised of workers and peasants. The signing of this treaty ended Russian involvement in World War One. The signing of the treaty also ended the left Socialist Revolutionary’s support of Lenin. Fearing a possible foreign invasion in support of the Romanovs, Lenin moved the capital of Russia to Moscow. Lenin’s government was facing opposition from a number of forces collectively known as the ‘White’ forces. Based in the south, they had been led by Kornilov but following his death were led by Deniken. Another ‘White’ force led by General Yudenich were forming near Petrograd. Compulsory military service was introduced for all workers and peasants that did not hire labour. The Romanov family were moved to Ekaterinburg in the Urals. The left Socialist Revolutionaries launched an attack on Communist Rule and an attempt to assassinate Lenin failed. War Communism began when a decree was issued that ended all forms of private capitalism. The left Socialist Revolutionaries assassinated the German ambassador to Russia. They hoped that the Germans would retaliate and help to end Communist rule. The left Socialist Revolutionaries attempted an uprising at Simbirsk but were defeated by the Red Army. The Romanov family were executed and buried in shallow graves. Under the economic War Communism policy it was decided that all surplus grain should be forfeited to the government. Strict grain quotas were issued depending on the type of labour done by individuals. Lenin introduced the Gulag system of labour camps to contain opponents of his regime. General Deniken, who had initially offered to join forces with Kolchak but had changed his mind and gone to the Dombass region, was defeated by the Red Army. The Red Army had virtually defeated the White force led by Kolchak. Yudenich’s attack on Petrograd was defeated when Trotsky took control and roused sufficient troops and workers to secure a Red victory. The Soviet Red Army launched a counter-offensive against the Poles and marched to the Polish border. Soviet forces had reached the outskirts of Warsaw. Western European powers fearing a Communist takeover of Poland, sent a military force to help the Poles. The Red Army were forced to retreat from Poland. Peasants in the Tambov region rebelled against grain requisitioning. Any factory that employed more than 10 people was nationalised by the government under its economic War Communism policy. The bread ration was reduced by a third leaving most people with a daily calorie allocation of just 1,000 calories. People were not happy. Lenin announced the end of grain requisitioing. Menshevik and Socialist Revolutionary workers went on strike. They were angry at the continual decrees of Lenin’s government and the lack of freedom they had. The Kronstadt sailors went on strike. They called for a return to true revolutionary ideals, that all working people be given equal rations and the peasants to be free. A group of soldiers met in Kronstadt square and demanded a new revolution. They complained of the fear of the Cheka and the lack of freedom of the people. Trotsky led a force to put down the revolt in Kronstadt. The Red Army assault on Kronstadt was repelled. Following heavy artillery battering of Kronstadt a new offensive was launched by Trotsky. After a long and bloody battle Kronstadt was taken. The Treaty of Riga officially ended the Russo-Polish War. Poland gained a large part of Belorussia. The Tenth meeting of the Communist Party was held. Lenin announced an end to War Communism and introduced a New Economic Policy whereby peasants only had to give a portion of the produce to the government, the rest they could sell and pay tax on the income. Private trading was also to be allowed in a bid to to increase availability of goods. In a bid to combat rising inflation a new Russian Ruble was introduced. 1 new ruble was worth 10,000 old rubles. Lenin created a new post, General Secretary and chose Joseph Stalin for the post. Stalin had been a loyal supporter of Lenin. Leading members of the Politburo supported Stalin’s appointment since they presumed that the post would be insignificant.